iPhone 6 and Galaxy S5 to both go bezel and button free? A new year, another set of flagship handsets from the twin titans of smartphones, Apple and Samsung - but will this finally be the year such devices can shake off the bezel in an effort to slim down even more? 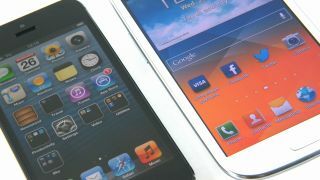 The Korea Herald reported that Samsung and Apple may face another rivalry in 2014 as speculation runs rampant the Galaxy S5 and iPhone 6 may each feature bezel-free, edge-to-edge displays. Samsung is likely to launch the initial offensive at MWC 2014 when the Korean mobile giant is expected to announce the Samsung Galaxy S5, which unnamed industry sources claim will be the model to finally ditch a hardware-based home button. Sammy is also rumored to be following Apple into the fingerprint scanner market, and the S5's will arpparently be offered on the bottom left and right sides of the bezel-free screen. Apple is also said to be testing a prototype of this year's iPhone 6 with a larger, bezel-free display that could also move the Touch ID fingerprint scanner found on the iPhone 5S onto the actual display itself. The eventual goal of both companies appears to be an edge-to-edge screen offering button-free fingerprint scanning from anywhere on the display, but "technological hurdles" remain that could delay such a feature until the second half of the year. Now that Apple has staked out the early fall season for its smartphone launches, that could give the iPhone maker an edge over Samsung, who is expected to begin selling the allegedly slimmer Galaxy S5 much earlier in the year. Samsung is also reportedly hard at work on touch panels that would allow its Galaxy devices to be used even while wearing gloves, part of a bezel-free initiative launched in 2012 under the code names "Project B" and "Galaxy B." Of course nothing is confirmed, so don't take the above as full-proof truth until both companies unveil their next-gen phone. It may have a bezel, but our Samsung Galaxy S4 review shows it's still a fine handset!